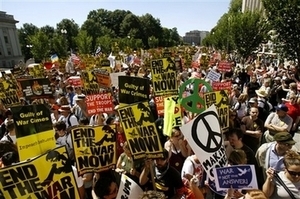 The ANSWER Coalition has worked tirelessly since September 14, 2001, to mobilize against the twin evils of war and racism and in support of social justice. Today, ANSWER chapters are active in more than twenty cities. Made up of dedicated volunteers and organizers, the ANSWER Coalition has succeeded in training an entirely new generation of activists. This work is continuing with the support of individuals like yourself who make invaluable financial contributions. Without this, we could not carry out the daily actions, mobilizations and educational campaigns that are a hallmark of our impactful work. We are pleased to announce that the Coalition has now established a way for our supporters to include the ANSWER Coalition in their estate planning. This is a meaningful way that your legacy can reflect your life-long commitment to social justice by sustaining an ongoing movement in opposition to war and militarism. Nothing is more important! You can name the ANSWER Coalition as a beneficiary on insurance policies, bank accounts, retirement plans and more. You can designate ANSWER as an inheritor in your will, and can also make donations of appreciated stock and other securities. It’s easy to get started, the steps are outlined at images.answercoalition.org/cms/plannedgivingsteps. If you would like more information, please contact our planned giving director Radhika Miller at 202-491-1000 or 202-265-1948, or by email at PlannedGiving@ANSWERcoalition.org. All inquiries will be kept in the strictest confidence. The movement for peace and justice is everywhere, in all countries – and it is sustained by the commitment, dedication and hopefulness of those who know that a better world is possible. Thank you for sharing that vision.